I have known Dr. Alan Waxman for about 6 years (since my third year of medical school), and this year, as a fourth year OB/GYN resident, I was invited to accompany him to Peru with the International Cervical Cancer Foundation, thanks to the availability of funding through the Benjamin H. Josephson, MD Fund. My experience was very enjoyable and rewarding, and I will strongly encourage residents and medical students to participate in future INCCA missions whenever possible. We flew into Lima late at night, and the next morning we took a flight to Cusco. After checking into our hotel, we immediately went to the new "Cervicusco" clinic to help unpack supplies and set up the exam rooms. Early Monday morning, we left on the two and a half hour drive to a small mountain village called Pitumarca, where we would spend the next few days. Our time in Pitumarca was definitely the highlight of the trip for me. It was like traveling back through time. 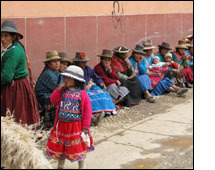 Almost all the women still wear traditional dress (many layered alpaca wool skirts, and hats that are unique to their town of origin) and speak primarily Quechua - very little Spanish. They also perform traditional roles - weaving, shepherding, childrearing. Many of the women reported having had more than 10 pregnancies and deliveries but had never experienced a pelvic exam or perhaps any type of formal medical care. We were welcomed to Pitumarca by the mayor, who said (if I understood him correctly) that his jurisdiction included 11 villages, with a total population of roughly 4,000. He planned activities for us at the end of each clinic day, proudly showing off the town and the skills of its citizens, and he held a ceremony of appreciation for us before we left. Each morning in Pitumarca, there was a long line of patients waiting outside the clinic for us upon our arrival. Many of the women had traveled hours to reach the clinic and had to wait hours more to be seen. Fortunately, most patients had normal exams, but among the almost 600 patients we saw in three days in Pitumarca, there were, unfortunately, several patients diagnosed with advanced cervical cancer. Because I was fluent in Spanish, I was frequently asked to translate during difficult discussions, such as delivering a cancer diagnosis. This was difficult, not only because I was giving bad news, but because there were significant cultural and even familial differences in attitudes toward cancer. Once, when I began to explain to a patient that her exam was consistent with cancer, I was interrupted by the Quechua interpreter, who sternly told me that I must not use the word "cancer" due to the stigma attached. In another instance, we had to explain to a patient repeatedly how advanced and life threatening her cancer was in order to convince her to leave her family and travel to Lima to seek treatment. I still wonder whether the patients we diagnosed with cancer will be able to come up with the resources to get to the national cancer center for evaluation. During the last two days of the week, patients were seen at the new clinic in Cusco. On the final night of the trip, a grand opening reception was held on the clinic rooftop, complete with traditional Peruvian musicians and beautiful mountain views. We received certificates of appreciation with the seal of the Peruvian government. Overall, the trip was a very positive experience, and I hope to be able to join INCCA on another trip (or trips) in the near future. I am very grateful to the Benjamin Josephson Fund for giving me this opportunity. Thank you.